Lot 319: Lucilla (d. 182). Denarius, 164-169. RIC III,274,762. Extremely fine/Good very fine. Estimate: 200 euros. In 138 Hadrian died, on 10th July. He had long been preoccupied with the question of his successor, as he and his wife Sabina had no children of their own, and his original candidates for the succession, including the L. Aelius Caesar, had predeceased him. Contrary to expectation, he chose Marcus Aurelius, his nephew, as successor, rather than Lucius Verus, the son of L. Aelius Caesar. Marcus Aurelius, however, named Verus co-emperor. And that’s when Lucilla came into play. As daughter of Marcus Aurelius and his wife Faustina she was ‘born to the purple’ into the imperial house in 148 or 149, and was the elder sister of Commodus. At the age of 11, as was usual with Roman girls, she was betrothed by her parents. Her future husband was to be Lucius Verus, they actually married in 164. Lucilla was therefore both the daughter and the wife of an emperor. She and Verus had children: the coin types IVNO LVCINAE, DIANA LVCIFERA and FECVNDITAS probably refer to the births, as in Roman religion Juno Lucina and Diana Lucifera were responsible for ensuring that children came safely to the light of day. Fecunditas was the personification of the ability to bear children, which is somewhat ironic given the fact that none of Lucilla’s children are known to history. Between 162 and 166 Lucius Verus was occupied in campaigns in the East against the Parthians. He succeeded in capturing the city of Ctesiphon and was awarded a triumph, which he celebrated in Rome. At this time Commodus and Annius Verus (another son of Marcus Aurelius’) were named caesares. 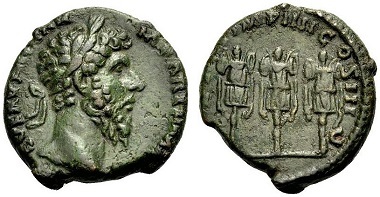 Lot 311: Marcus Aurelius, as Caesar, 138-161. Denarius, 153-154. C. 673. Good very fine. Estimate: 200 euros. Pompeianus was not a member of the imperial family and therefore Lucilla was no longer an empress. This seems to have come as a great blow. Nevertheless, she and her new husband accompanied Marcus Aurelius on his campaign on the Danube in 178. A year later, Marcus died in Vienna, apparently from an illness. Upon his death, Commodus, Lucilla’s younger brother, was proclaimed emperor in Rome. Lucilla was apparently unhappy with this choice. She may have assumed that her husband Pompeianus would be made emperor; perhaps she detected the first signs of instability in Commodus. Historians have also pointed at possible tensions between Lucilla and Commodus’ wife, Bruttia Crispina. Whatever the exact background, a plot to assassinate Commodus was uncovered in 181/2 (in RIC, 183). It was led by Pompeianus’ nephew. Lucilla came under suspicion of having supported him and was banned to the island of Capri, where she was eventually executed. She was still in her mid thirties. Commodus continued to reign in an increasingly eccentric manner until 192, when he fell victim to another plot and was strangled by the athlete Narcissus. Thus the known ‘facts’ about Lucilla. As very few accurate historical sources survive for the period, these have been gleaned by scholars from the often fantastical or inaccurate accounts of Herodian and others, and the exact dates are often conjecture. Lot 313: Lucius Verus, 161-169. As, 166-167. RIC 329,1464. Nearly Extremely fine. Estimate: 250 euros. The coins themselves, which were probably all struck during Lucilla’s marriage to Verus (ca. 164-169) – the legends proclaim LVCILLA AVGVSTA or LVCILLAE AVG ANTONINI AVG F. the latter ‘Lucilla Augusta daughter of Antoninus’ – show no sign of a turbulent history, and present a variety of portraits of the young empress. Although these all show her with a similar hairstyle, braided and then bound at the back in a chignon, there seem to have been many different dies – sometimes the braids are vertical, sometimes horizontal, and sometimes she has a thin braid across her forehead and hair in ornate waves behind. Portrait busts, e.g. those in Erlangen and Ostia, also show her with a chignon hairstyle. Lot 342: Lucilla, (d. 182). Denarius, 164-169. RIC III, 276, 791. Very fine. Estimate: 120 euros. The reverse types reflect Lucilla’s role as empress – these types had developed over time and are similar to those used for other empresses (it was only after the empire, starting with the coins of Livia during the reign of Tiberius, that women – as relatives of the emperor – were portrayed on coins at all). Lot 333: Lucilla, (d. 182). Aureus, 164-169. RIC III,276,783. Very fine. Estimate: 3,500 euros. On a rare gold aureus (Lot 333) the goddess Venus is portrayed holding a sceptre and an apple – a reference to the golden apple awarded to her during the mythical judgement of Paris after she had promised him the most beautiful woman in the world as his wife (which of course led to the abduction of Helen and the start of the Trojan war). Venus types are particularly common among the coins of Lucilla. PVDICITIA (depicted drawing a veil up to her face) and PIETAS (depicted sacrificing before an altar) also refer to virtues which an empress had to possess; while the former, a quality similar to modesty, was particularly associated with the ideal behaviour for a woman in Roman eyes, the latter was a typically ‘Roman’ virtue comprising duty towards the gods, the family and the empress’s care for the Roman people. VOTA PUBLICA (Lot 342) refers to the collective vows of the Roman people for the health of the imperial family. These coins form part of a collection which will be sold at auction in Stuttgart, on 25th November 2016, by Münzen & Medaillen GmbH, Weil am Rhein. Bids can be placed at Biddr and Sixbid, and it is also possible to register to bid live through these platforms. You can read an auction preview in CoinsWeekly.